Area A2: in addition to the excavation of various installations, Louise’s team has some new early Iron I (and possibly LB) architecture – with much promise to come. 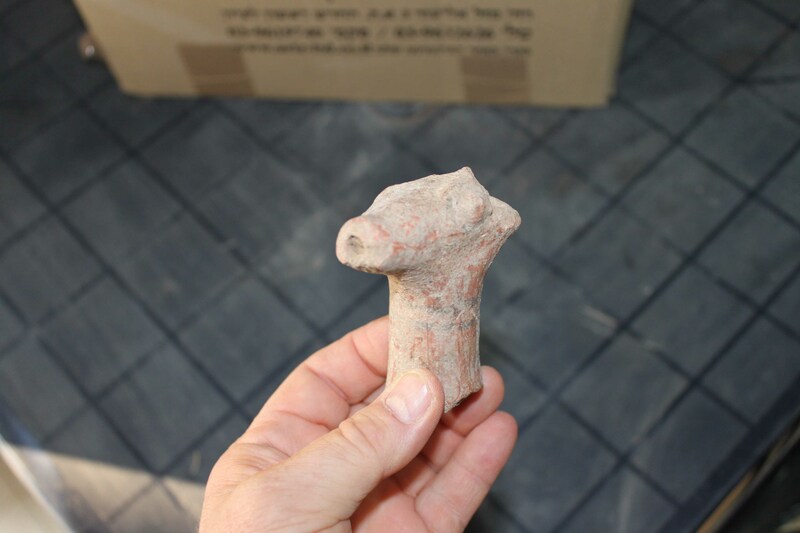 Area E: Itzik and Haskel’s team are working in various parts of the EB quarter and has some nice finds. A very interesting bead (?) made out of a reddish stone that still has to be IDed; an assemblage of pottery from an early EB III level – very important since it may start providing dates for the earlier phases in this area. In addition, Steve Weiner, who is working on the northern part of Area E on a section with Iron I and LB materials, seems to have found a very sequence between these two periods – which will hopefully provide good materials for 14C datings of this transition. Area D: Amit and his team found some very interesting finds, including what appears to be a completely unique animal figurine made out of local chalk, coming for an excellent context of the Iron IIA destruction level, along with a slew of other objects and vessels. 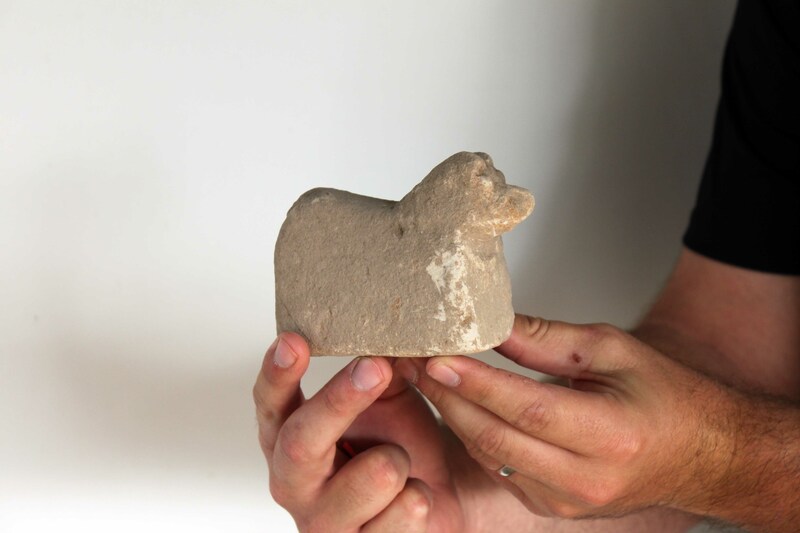 Here’s a picture of Chris McKinny holding the very unusual zoomorphic statuette found in Area D. It is made of the local soft chalk stone, and is in the shape of perhaps a lion or a dog? Off hand, I’m not aware of any Iron Age parallels to this (but this clearly needs to be looked into). Definitely MEGA-COOL!!!! And here is a picture of the head of a decorated zoomorphic vessel – also from Area D. Notice the “Late Philistine Decorated Ware” type of decoration (red burnishing and painted black and white lines) – cool! Area P: Alex and Jill’s team are discovering enormous architectural features which are far from fully understood, but along with are finding interesting early Iron I, LB and EB pottery. Here is Adam, member of the P team, smiling after discovering a very nice part of an LB imported Myc IIIB stirrup jar! Area F: Jeff and his team are working on a whole bunch of periods: a Medieval/Modern surface; the collapse of the Blanche Garde fortifications in two places; and what appears to be the top of the Iron IIA destruction level. Great day – and lots more of finds yet to come! 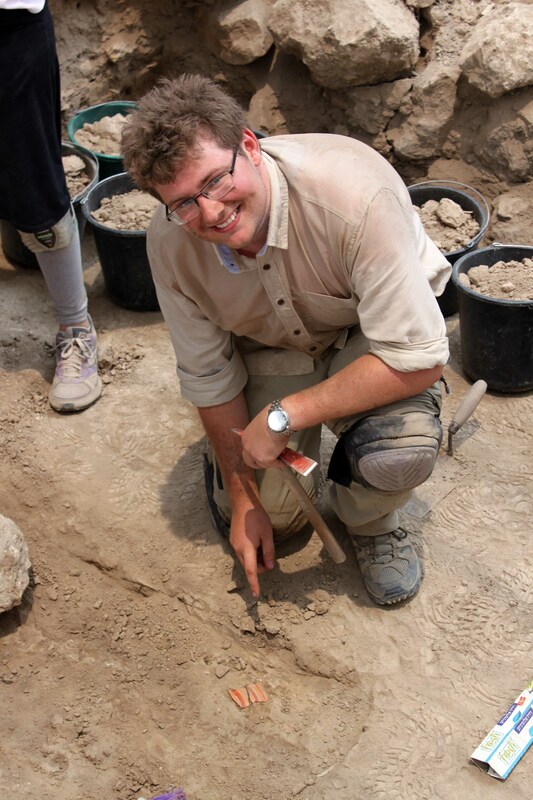 Update for July 11th, 2012 – lots of finds! Sounds like a good time up there in Area F, but I guess my perspective is a bit late. . .